The steam barge occupies a short chapter in the history of Great Lakes shipping. Designed to carry grain or iron ore, it sailed for a short period of time between the era of bulk, cargo-carrying lake schooners and the steel lake freighters still used today. Before the steam barge, lake schooners almost exclusively carried bulk cargo. The large deck hatches of the schooner were better suited to loading and unloading bulk material. The typical passenger steamer, with upper cabins, required cargo to be loaded through the side of the ship. The first steam barge, the R. J. Hackett, was built by Eli Peck of Cleveland in 1869. The Hackett was a wooden vessel, 211 feet long, with the pilothouse forward, single engine aft driving a single propeller and a long open deck with large hatches spaced to match for unloading machinery then in use at the ore docks along the Lakes. The ship also carried three masts with a cut down lower sailing rig (no topsails) as used on the schooner barges towed behind steamers on the Lakes during the late 1800s. In 1882, the Globe Iron Works of Cleveland launched the Onoko, the first steam barge with an iron hull. By 1886, Globe Iron Works also launched the first steel-Sault Locks -- which connects to the Saint Mary's River and the Lower Lakes. Whitefish Point is now designated as one of Michigan's underwater shipwreck preserves. No artifact collecting is allowed. 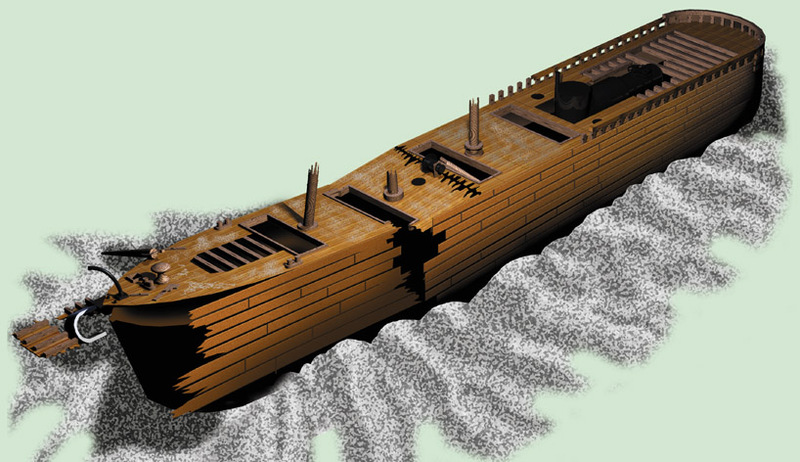 Of the approximately 16 shipwrecks in the preserve, three of them are steam barges, probably the largest concentration of this rare vessel type in the Great Lakes. Quale & Martin of Cleveland built the 191-foot-long Vienna in 1887. The up bound steamer Nipigon, under clear conditions, struck the down bound ship on September 16, 1892. Both Vienna and Nipigon were towing barges at the time of the collision. Tow lines to the barges were dropped and the Nipigon attempted to beach the sinking Vienna. The effort fell about a mile short of the shore, with Vienna sinking in about 145 feet of water just south of Whitefish Point. The shipwreck was discovered in 1974. Because of its location only a mile from the harbor of refuge at Whitefish Point, it is the most visited shipwreck in the Whitefish Point Underwater Preserve. 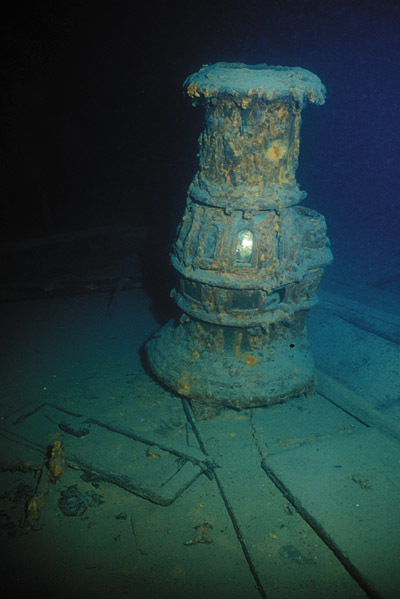 Because the wreck was discovered before the current era of shipwreck preservation, many of the artifacts have been removed. Thankfully, some of them are now on display at the Shipwreck Museum at Whitefish Point. The museum has ship models and displays artifacts from every wreck in the area. One of the more impressive displays is the carved wooden pilothouse eagle from the Vienna. With some of the gold paint still on its wings, the eagle is on display just inside the door of the museum. The Vienna is an excellent dive. The main hull is intact up to the bow, which is split open allowing the deck to collapse into the first level of the hold. Dropping into the sand at the starboard side of the bow, a diver can find the remains of the octagon pilothouse next to the forward mast. The forward anchor locker has the main deck collapsed into it. The anchors were salvaged in the '70s. Aft of the bow area, the main hull is intact. Divers discovered one of the lifeboats out in the sand a few years ago, and placed it on the main deck next to the broken stump of one of the masts. The area around the engine and boiler are open, but it is possible to squeeze into a couple of small storage rooms aft behind the engine. The back cabins are gone with a large portion of the hull open above the crew area. The remains of the privy, a capstan, and the large towing bit (used to tow one or two loaded barges) can be seen in this area. 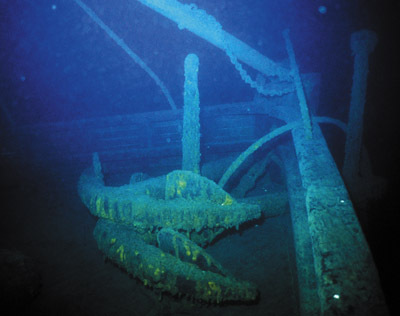 Below the stern is the rudder, propeller and load marks still visible after 110 years underwater. The 178 foot John M. Osborne, hull number 76307, was built in 1882 in Marine City. Down bound with a load of iron ore, the Osborne was struck from behind by the steel steamer Alberta on the evening of July 27, 1884, while traveling in fog. The Osborne was towing two barges at the time of the collision. A passenger aboard the Alberta was lost with two of the Osborne's crew when he tried to save them from the fire hold, where they were trapped. The Osborne was located about eight miles from Whitefish Point in Lake Superior in 1984. The ship rests upright in 160 feet of water, with a little over 170 feet of depth possible inside on the keel. The collision left one-third of the wreck broken up. The upper deck and cabins are gone, leaving the engine deck and engine open. The engine is quite interesting, with a wood water jacket and main steam line insulation. The painted red base with white graphic decorations is intact after almost 120 years underwater. Osborne Bow: Twin anchors stowed on the foredeck. 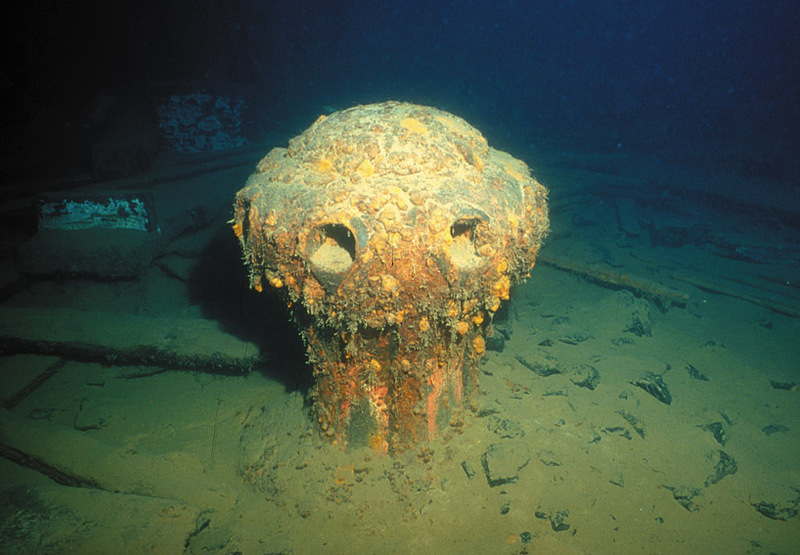 Stocks are outside the hull and their chains lead to a locker in the bow, one deck below. The boiler has unshipped its original location, now lying aft of the engine on the starboard side. The propeller and structure at this end are heavily damaged. Forward of the engine area, the Osborne is intact. Masts are draped over the deck and over the side. Much of the rigging and ratlines are still bolted to the side of the hull. At the bow, the capstan has collapsed on deck, but the twin anchors with handling equipment are still in place. Below the forward deck area, a small stove still remains bolted in the crew area. Forward is the anchor room with a large chock for stopping chain. Equipment blocks are found still hanging from hooks on the side of the hull. Protected by the cold, clean water of Whitefish Bay, the 246-foot-long shipwreck of the Samuel Mather is the largest, deepest, most preserved steam barge in the Underwater Preserve. Upright in 180 feet of water off Ile Parisienne with two of its three masts still standing -- one reaching to within 90 feet of the surface -- the Mather is probably the favorite wreck dive among regular divers in the area. Built in 1887 in Cleveland, the ship was struck near the bow on the starboard side by the steamer Brazil on the foggy night of November 22, 1891. All hands were rescued and taken aboard the Brazil. Tom Farnquist, Executive Director of the Great Lakes Shipwreck Historical Society, discovered the wreck in 1978. Many of the artifacts were removed and are on display at the Shipwreck Museum at Whitefish Point. 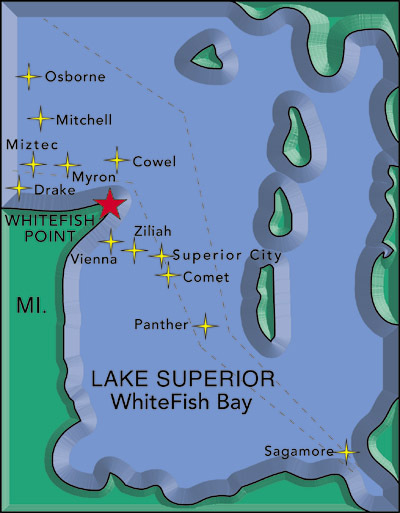 The wreck is about a 17-mile run down Whitefish Bay from the harbor at the point. Any wind from the South tends to put a nasty chop on the bay. Charter boats generally will only make the run in good weather. Osborn Below Deck: A small stove mounted in the crews quarters below deck just aft of the chain locker in the bow. Within seconds after the Nipigon's bow cut deep into the Vienna's forward port side, icy cold water flooded her forward holds causing the Vienna's bow to sink first. Like a torpedo the vienna's bow struck the lake bottom causing her pilot house and much of her forward rigging to be thrown onto the lake floor in front of the ship. This impact was so great that the bows decking was actually ripped free from the haul and now lies completely separated. Upon sinking the rear cabins were ripped free from the ships frame work. The smoke stack and most of her rigging was also dislodged and is now missing from the wreckage. Below deck you can see the coal bunkers, a work bench and most of the steam engine. Because the shipwreck lies directly in the shipping lane, keeping a mooring on the wreck is difficult. It is not unusual to make the long run only to find the buoy missing. Clearing these hurdles rewards a diver with one of the best wreck dives in the Great Lakes. The aft cabin area is mostly intact -- a rare find on any wooden steamer shipwrecked over 110 years ago. The mooring is often tied to a boiler vent on the cabin roof. Dropping on a clear day, a diver can see the tip of the aft mast at 90 feet. Continuing down, one will see the cabin roof with a water tank funnel opening and an intact vent. The stack toppled onto the deck just forward of the cabins. Two of the standing masts, one with rigging still attached, have some of the paint still visible around the fife rails and base. The cargo hatches lead to the typical double bottom cargo hold, which could carry packaged freight as well as bulk cargo. The bow area is damaged from the collision. It has two unusual folding navy-type anchors. The bow mast is not standing and hangs over the port rail. Back on the main deck alongside the cabin area, turned posts rise from the rail supporting a full roof over the deck. At the rear deck is a large Samson post used for towing barges. It is possible to enter the crew area in the stern through an open hatch on the outside of the hull just below deck level on the starboard side. Inside is a double stairway leading to the main deck above. The opening is now covered by the partial collapse of the roof over the rear deck. The crew area is aft. Forward is the engine room, with control levers mounted on the starboard side. The gauge panel was removed and is on display in the museum. All three of these vessels lived during the short time when technology was swiftly changing transportation on the Lakes. As they lived and died, Lake Freighters would lose sails, hulls would become steel instead of wood and electric running lights would replace the oil lamp. Sailing during the most dangerous time of transportation on the Lakes due to the heavily-traveled approach of the Sault Locks and St. Mary's River, it is not surprising that these three steam barges sank within 20 miles of each other. The cold, clear waters of Lake Superior and Whitefish Bay provide a unique opportunity for divers to discover an era when America was just beginning to feel its power as an industrial nation.